Snapchat is the photo-sharing app that lets users send vanishing content to their friends and followers. These photo or video “snaps” can be viewed for up to 10 seconds before disappearing from the screen – with the caveat that recipients can save snaps or capture a screenshot. Snapchat caught fire with the millennial set, and today nearly 1/3 of all U.S. millennial internet users access Snapchat regularly. 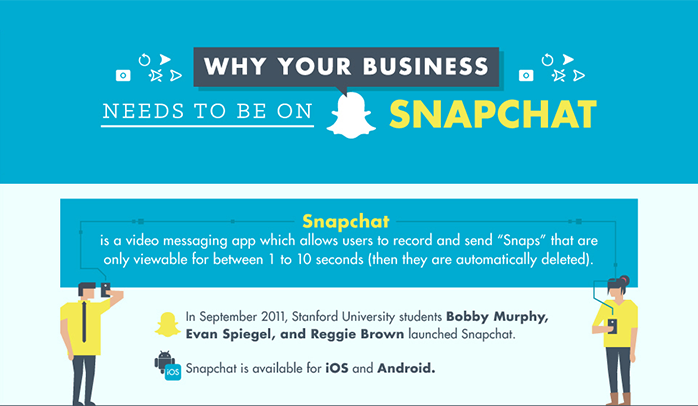 In addition, Snapchat boasts 100 million daily active users. With this many eyeballs on the app, marketers are trying to leverage the platform to reach more customers. Does it fit your audience? Sure, teens and millenials love sharing vanishing photos on Snapchat – but can you find your customers there? Snapchat hit the 100 million user mark, but it may be more conducive to some audiences than others. In fact, 45% of Snapchat users are between the ages of 18 and 24. That makes it a bit of a stretch for B2B companies who would typically target an older demographic. If you’ve built a social media presence on Facebook, Twitter or LinkedIn, you know how difficult it can be to build a network of followers. Do you have the bandwidth to replicate those efforts on Snapchat? Growing your Snapchat following means incorporating Snapchat in all of your marketing efforts – from adding it to your About page, to including it in email signatures and even talking about your Snapchat presence on other social networks. Maybe building a customer following on Snapchat isn’t in the cards. But if influencers in your industry are engaged with the platform, it could be a opportunity to reach them with your message and get them to talk about your brand. Influencers can help you create and share your content with their audience on Snapchat and other channels – giving major lift to your brand. So for a brand that may not want to jump right into manning or staffing a channel like Snapchat—or having somebody that has to sit there and take the time to understand the audience and think about it—they can work with influencers who are already named to the platform to really save them a lot of operational costs and get a significantly better outcome. Does my business have timely updates to talk about? For instance, if you’re in real estate, you could send a snap to tease a new listing before it goes on the market. Can we leverage Snapchat for live events? Geofilters make Snapchat content even more relevant and engaging. Geofilters are photo overlays only available to you if you’re in that location. For example, if you’re on the tradeshow circuit, you could use Snapchat Geofilters to create an instant bond with other people at the conference. On the flip-side, sharing behind the scenes travel snaps or action pics of your booth can make a global audience feel like they’re there. Can we get more personal with our audience using the platform? I really like SurePayroll‘s example of introducing new employees to your audience with a snap. If your business is growing and you’re ramping up your team, this could work for you. Do we have a promotion strategy that we could use in tandem with Snapchat? If you’re a software company, for example, you might share a coupon code for a free upgrade to get prospects to sign. Could Snapchat be your secret to building an engaged following of prospects and customers? I think the jury is still out for small businesses, especially B2B. Unless Snapchat starts attracting a more diverse audience to their platform, it’s going to be best left to B2C companies marketing to millennials.